Young, 41, was a Navy Captain who had flown on three previous spaceflights (Gemini 3, Gemini 10, and Apollo 10; he later flew on STS-1 and STS-9), Mattingly, 36, was a Navy lt. commander on his first spaceflight (he later flew STS-4 and STS-51C), and Duke, 36, was an Air Force lt. colonel also on his first spaceflight. 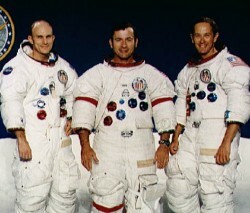 The backup crew for this mission was Fred Haise, Stuart Roosa, and Edger Mitchell. Apollo 16 was the fifth mission in which humans walked on the lunar surface and returned to Earth. Apollo 16 launched on a Saturn V from Pad 39A at Kennedy Space Center. The launch was postponed from the originally scheduled date, March 17, because of a docking ring jettison malfunction. 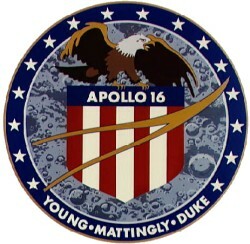 On 21 April 1972 Commander John W. Young and LM pilot Charles M. Duke, Jr. landed in the Descartes region of the Moon. CM pilot Thomas K. Mattingly, II continued in lunar orbit. Young and Duke made three moonwalk EVAs totaling 20 hours, 14 minutes. During this time they covered 27 km using the Lunar Roving Vehicle, collected 94.7 kg of rock and soil samples, took photographs, and set up the ALSEP and other scientific experiments. The LM took off from the Moon on 24 April and the astronauts returned to Earth on 27 April. 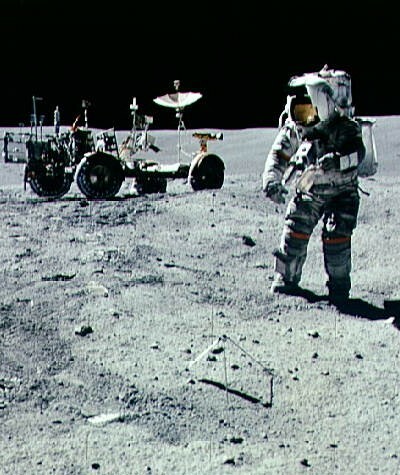 The primary mission goals of inspecting, surveying, and sampling materials in the Descartes region, emplacement and activation of surface experiments, conducting inflight experiments and photographic tasks from lunar orbit, engineering evaluation of spacecraft and equipment, and performance of zero-gravity experiments were achieved despite the mission being shortened by one day.